Officials will gather just outside Springfield on the morning of Sept. 6 to mark the completion of a new hatchery that is intended to boost recovery of Snake River sockeye. The $13.5 million facility will be capable of producing up to one million juvenile sockeye annually for release in the Sawtooth basin of central Idaho, the headwaters of the Salmon River. This additional incubation and rearing space will move the sockeye recovery effort from the conservation phase to a re-colonization phase where emphasis will be on returning increasing numbers of ocean-run adults to use in hatchery spawning and to release to the habitat for natural spawning. It's hoped the increase may eventually mean recreational and tribal fishing seasons. The hatchery will be operated by Idaho Fish and Game and was funded by the Bonneville Power Administration as part of its obligation to mitigate the impact of hydropower dams on salmon and steelhead. The Springfield Fish Hatchery was designed and constructed by the Idaho-based engineering firm of McMillen LLC. The water supply for the Springfield facility is more than 50 cubic feet per second of cold, clean spring water - just right for raising sockeye. Snake River sockeye were listed as an endangered species in 1991. Idaho Fish and Game initiated conservation and research efforts for sockeye earlier that same year. Just a few years later the number of adult sockeye returning from the ocean to the Sawtooth basin dropped to zero -- in 1995 and 1997 -- but reached 1,336 in 2010, an amount not seen since the 1950s. This success resulted from redundant captive broodstock programs operated at hatcheries in Idaho and Washington. Today the sockeye are produced at hatcheries in Idaho, Washington and Oregon. Snake River sockeye rearing and spawning habitat in the Sawtooth basin is considered to be in excellent condition because it has experienced limited human impacts. 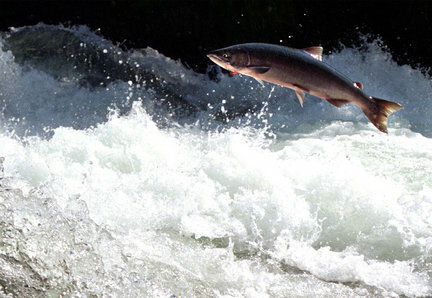 The current run of sockeye into the Snake River is one of three remaining populations in the Columbia River basin. The other two populations are in Okanogan and Wenatchee lakes, on tributaries of the upper Columbia River. Efforts are under say to rekindle historic sockeye runs to the Deschutes River basin in central Oregon and south-central Washington's Yakima River basin. Partners in the sockeye recovery effort include Idaho, Oregon, Washington, NOAA-Fisheries, the Shoshone-Bannock Tribe, the Bonneville Power Administration and the Northwest Power and Conservation Council. For more information, see CBB, August 16, 2013, "Dedication Set for New Hatchery Intended to Move Snake River Sockeye Recovery to Next Level"